Whenever I am in Maui I have to check and see if my favorite wave is breaking. Way up on the Northwest side of the island, about twenty minutes past Lahaina, an idyllic bay sits in the perfect position to wrap big northwest swells around its point, creating a perfect peeling right known as Honolua Bay. A 'right' as surfers know it means that because of the direction the waves breaks over the reef, when you pop up on your board you travel to your right down the wave. 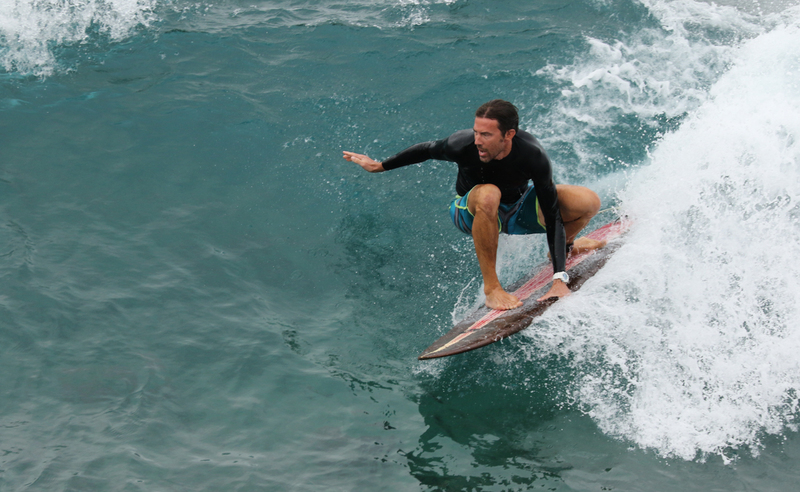 I prefer 'lefts' since I surf goofy-footed, or right foot forward, and going left leaves me facing the wave. But I can't pass up a right as perfect as Honolua. I will often pig dog the wave, which means to reach down and grab the rail of the surfboard like I'm doing in the picture above. It can be a mission just getting up to Honolua, so it's always better to do it with friends. 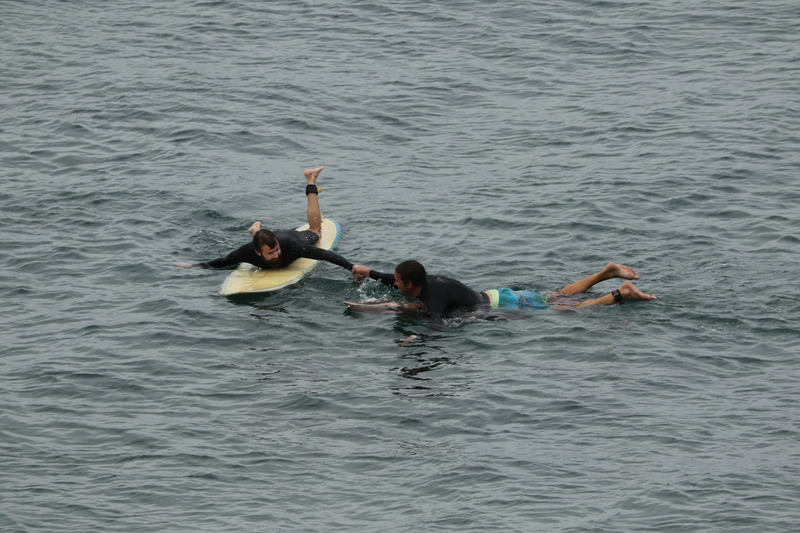 This time my good friend Ben was also surfing. He is a goofy-foot as well although his style is slightly different than mine as you can see below. Once you surf with people long enough you can barely see them way out on the waves and know exactly who it is by their style. Everyone is a little different. 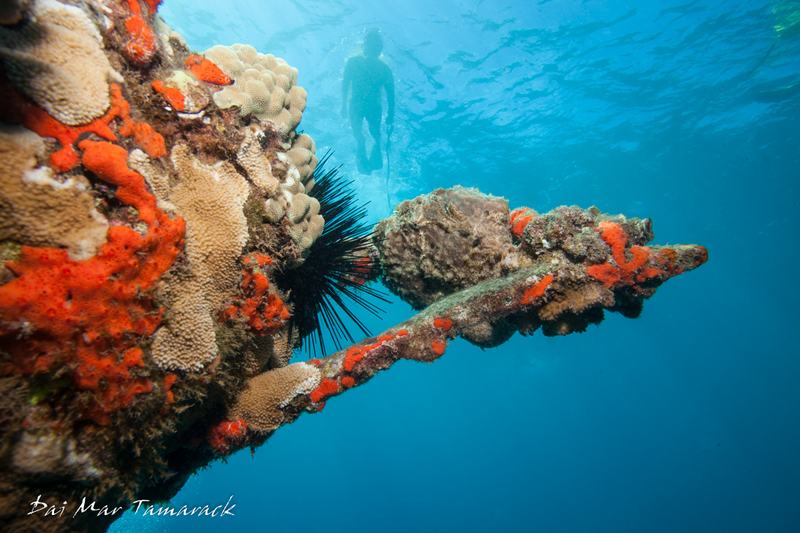 One of the more well known shore snorkels/dives on the Kona coast of the Big Island is a place called Two Step, or O'Hanaunau Bay. 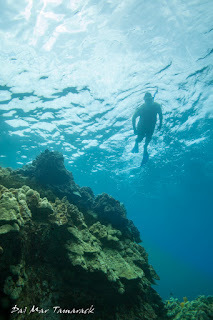 Not only is this the site of a ancient city of refuge for the Hawaiians, but quite possibly some of the most stunning snorkeling in Hawaii that is easily accessible from shore. There is parking nearby and even though it is a lava rock coastline there is an easy entrance formed by two smooth lava rock shelves that you can step down into the calm water from. Two Step is located about 20 miles south of Kona town. 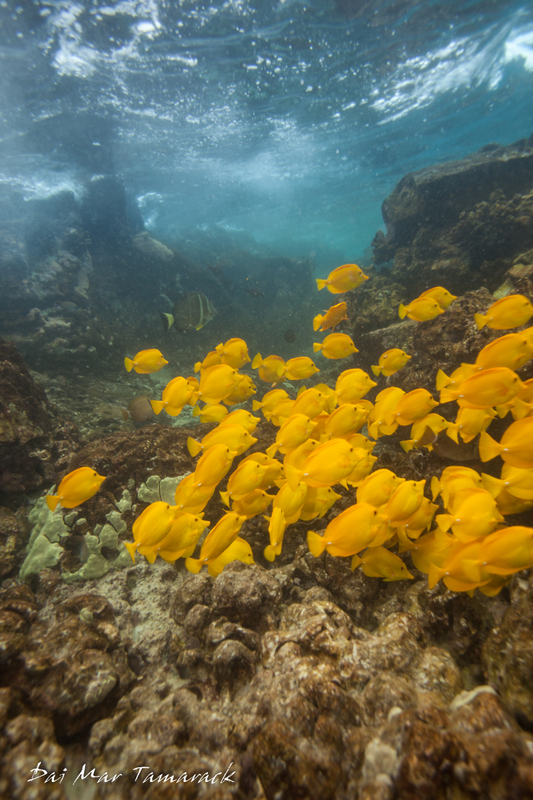 Big schools of yellow tangs graze the expansive coral reef in the shallows. 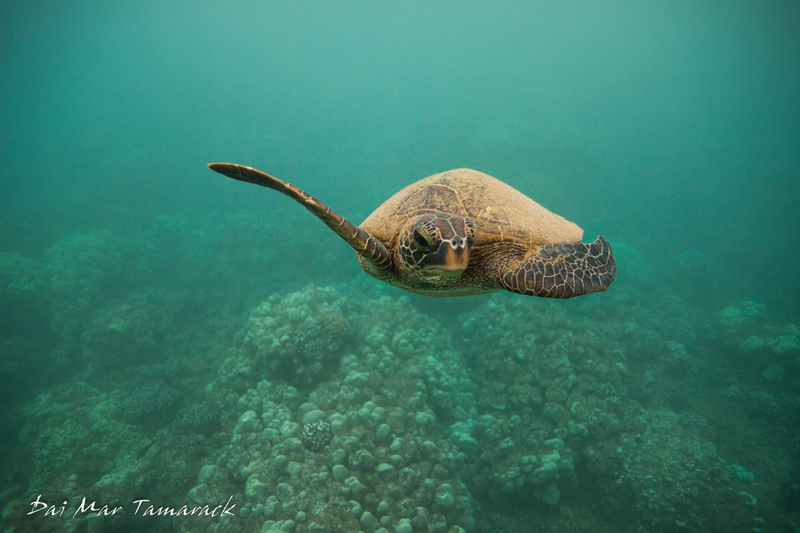 Sea turtles are also in the area, often napping under ledges or feeding on algae in the shallows. The water here stays clear and calm almost every day of the year thanks to the direction the bay is facing and the lack of runoff due to being in an arid environment. 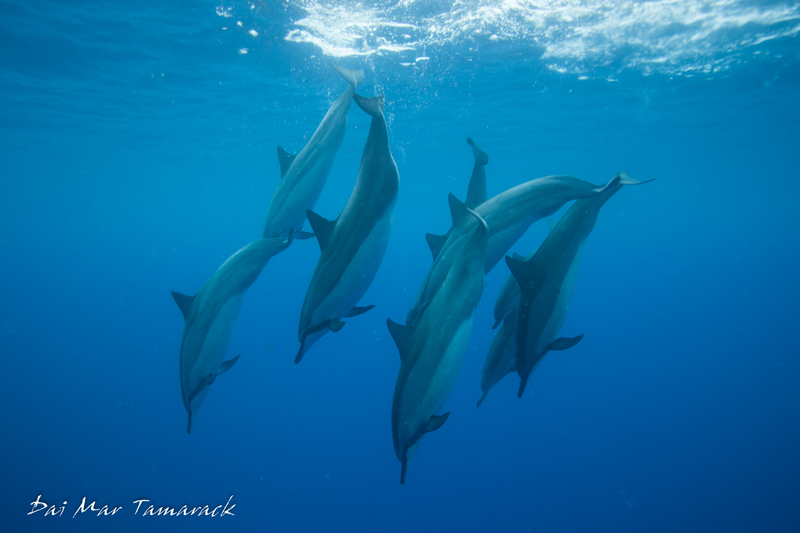 One bonus that sometimes happens at Two Step is the chance of seeing a pod of Hawaiian spinner dolphins swimming in the bay. When you first show up take a look out into the deeper darker blue water in the middle of the bay and looked for the light grey triangular dorsal fins of the dolphins as they come up for air. 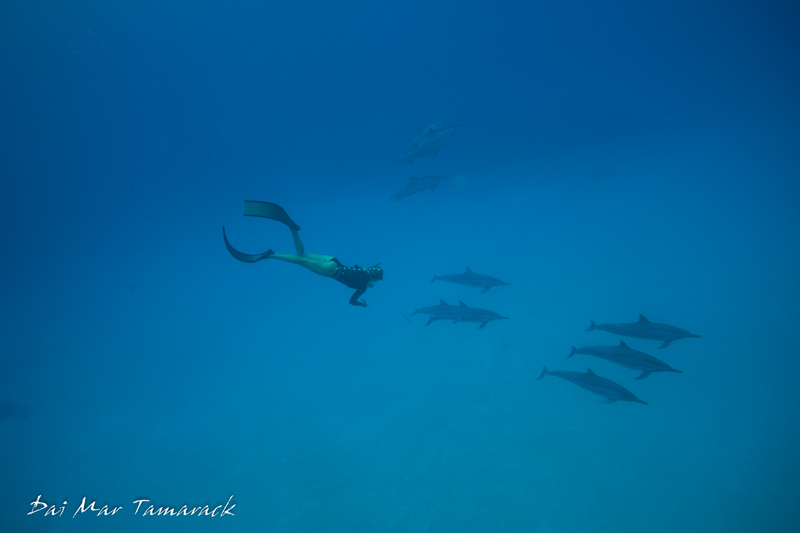 If you are feeling up for a little swim this can be one of the best places in Hawaii to swim with wild dolphins. This day we got lucky as the dolphins stayed in the bay the entire time we were there. Your best chance of swimming with the dolphins is morning time. This is one of those adventures that is not to be missed. 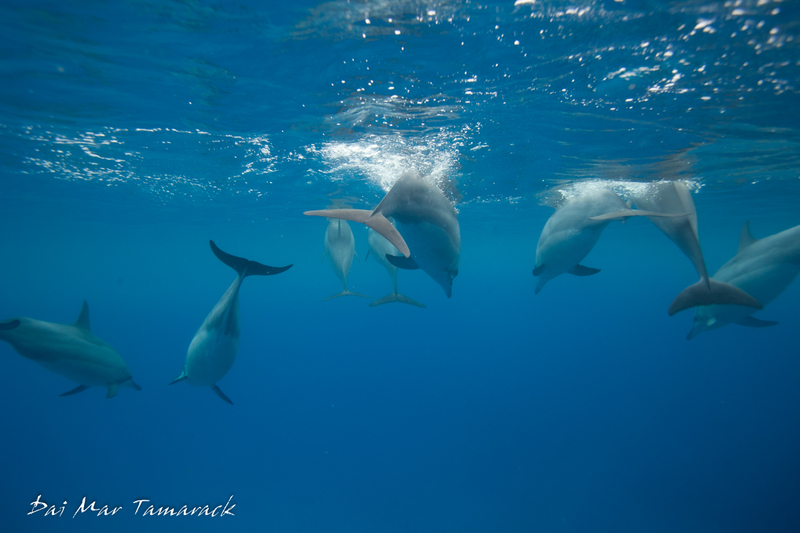 For full resolution pictures of dolphins and Hawaii check out www.daimarsphotos.com/Hawaii. 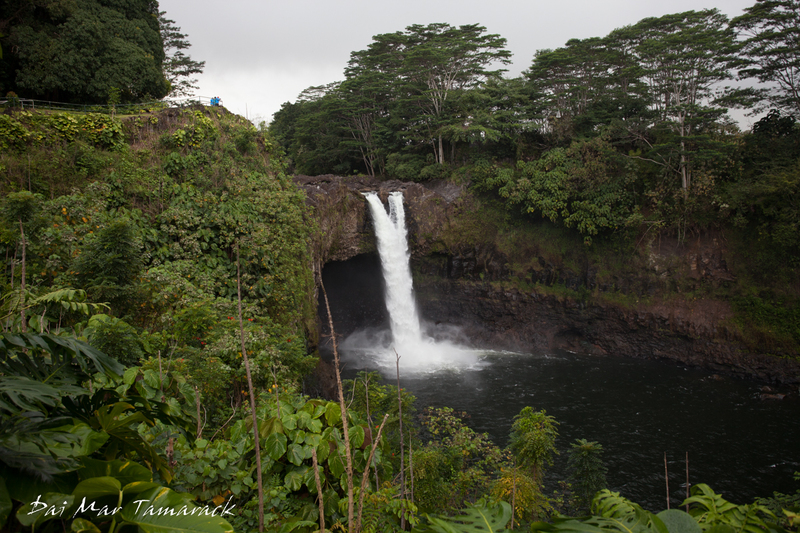 There are three ways to drive from Kona to the Hilo side of the Big Island; south past Captain Cook, South Point and the black sand beach, middle across the scenic saddle road, or north along the Hamakua Coast. 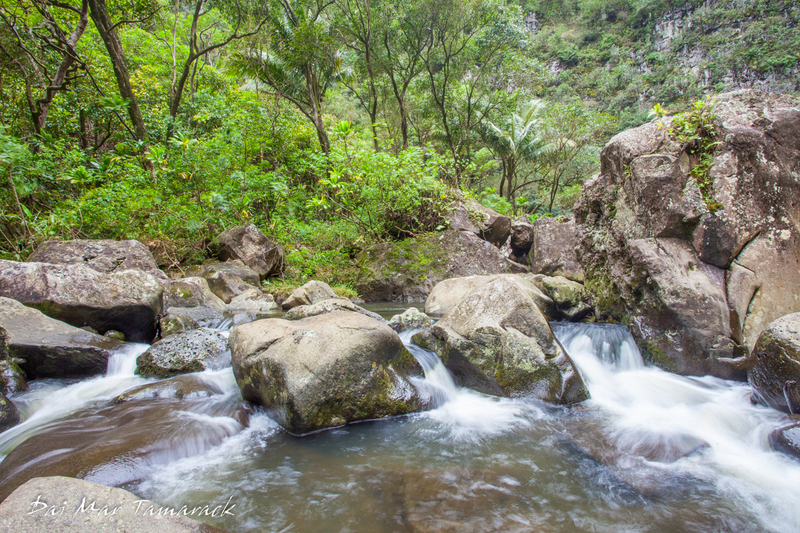 All of these options have amazing sights, but for this blog post I am going to focus on the Hamakua coastline, or what I like to call the "Waterfall Coast". 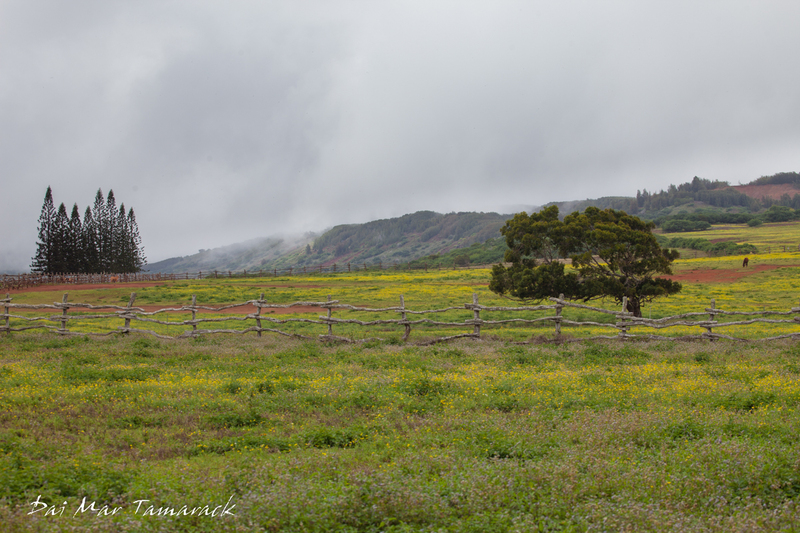 This is the rainy side of the island, and that point is obvious once you get through the little cowboy town of Waimea. Here the dry yellow grass turns into lush green pastures, which quickly gives way to tropical rainforest. The road curves around huge gulches which have been carved out by thousands of years of heavy rainfall. 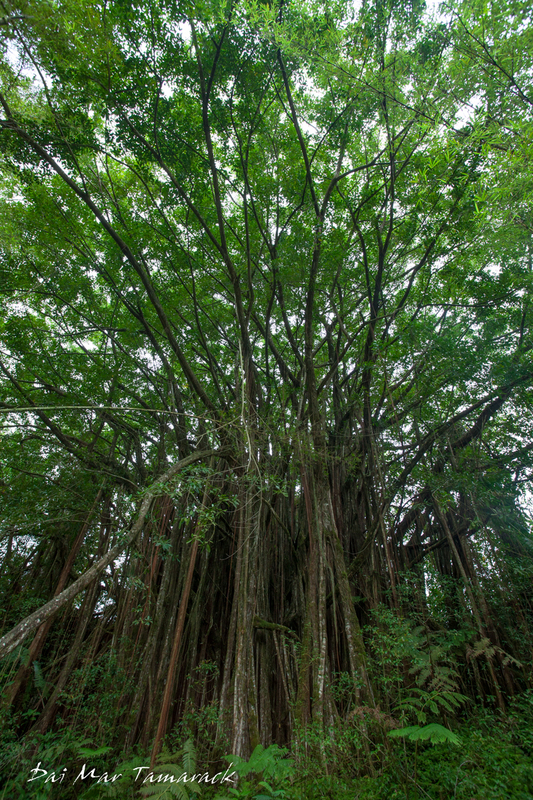 Flame trees light the canopy up with bright orange flowers among the many shades of green. Wild ginger and heliconia fight for space with huge ferns which remind me of Jurassic Park. 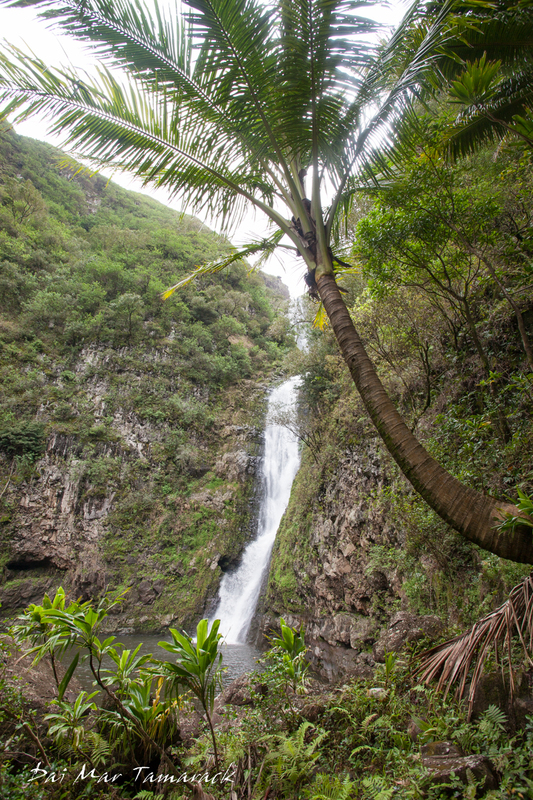 And with all the rain this is where you can find some of Hawaii's most spectacular waterfalls. 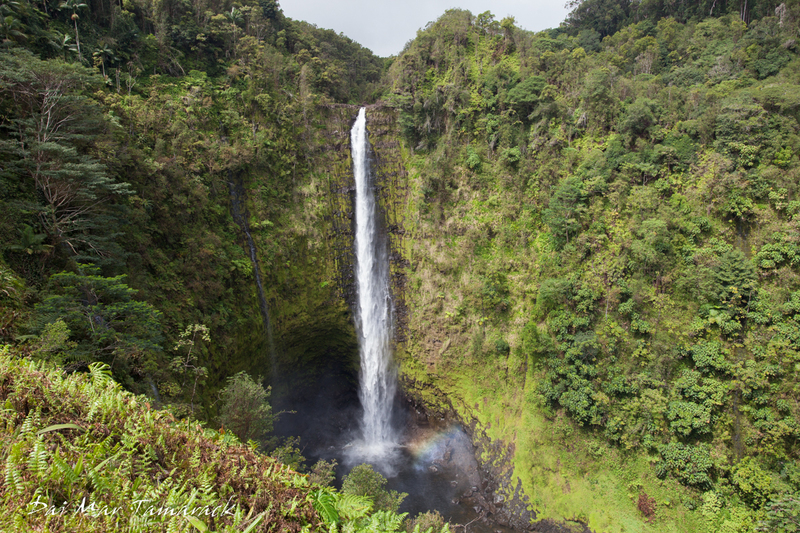 One of the tallest and easiest to access waterfalls is Akaka Falls. 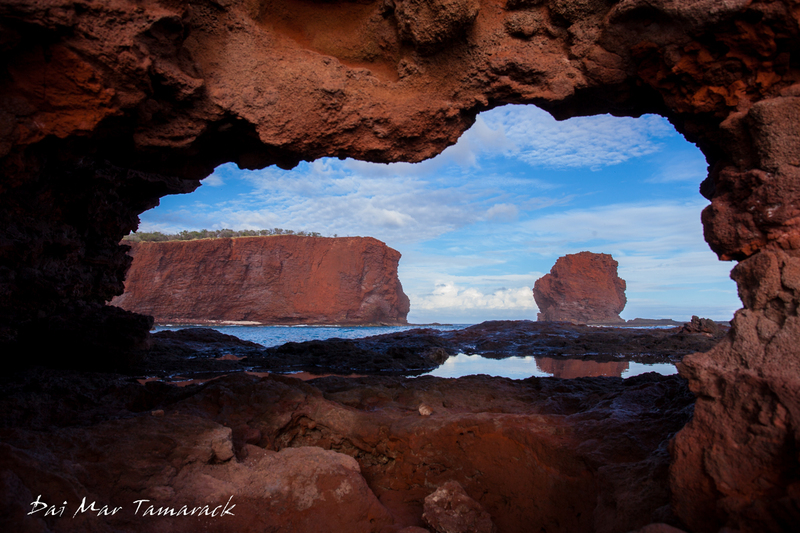 Now a state park, there is a $5 parking fee and $1 entrance fee, (free for Kama'aina), which it totally worth it. The concrete path takes a loop through the dense tropical rainforest with a lookout over two different waterfalls. The water tumbles off a rocky cliff 442ft straight down into a pool below. It is only a 3 mile detour off the main road and well worth the stop. If it's raining then wait a couple of minutes and it may stop. 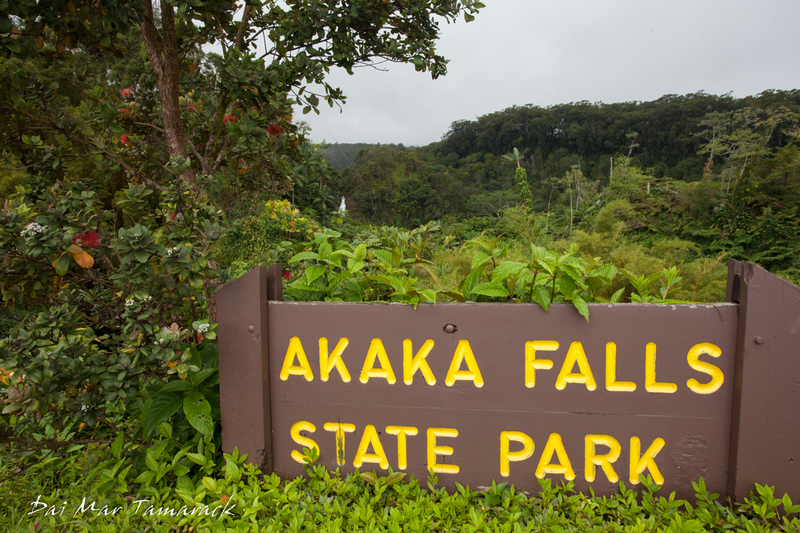 Akaka Falls is about 11 miles north of Hilo. Just as you enter Hilo town you will cross a bridge covering a pretty wide river. 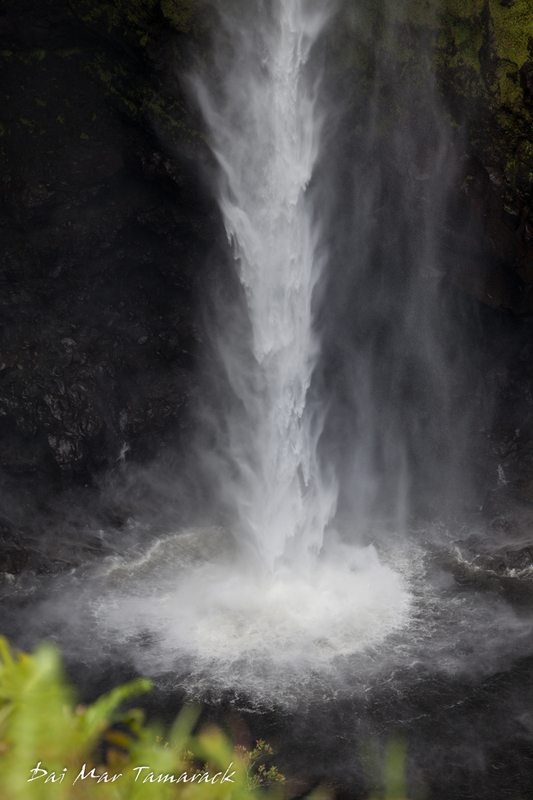 Follow this river up a few miles through town and you will come to another famous waterfall called Rainbow Falls. If you get lucky enough to come on a sunny day you may just get a rainbow in the crash zone at the bottom of the falls. There is a trail here that can lead you to the top of the falls if you are feeling brave and want to peak over the edge. Or if you are into cliff jumping follow the river a few more miles up to a spot the locals call Boiling Pots for some extreme cliff jumping. My advice on this is always watch the locals do it first and follow their lead. 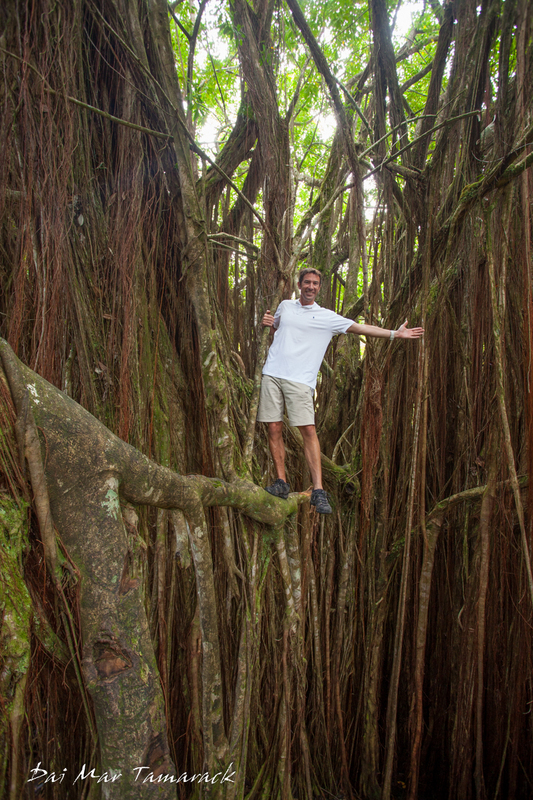 It is pretty amazing what you can do with just one week, a boat, and an adventurous spirit here in the Hawaiian Islands. This past week onboard the Safari Explorer I had the benefit of a smaller charter group who had a focus on photography. I tried to go all out in their itinerary giving them ample opportunities for amazing photos and after looking through all of my photos I think the rest of the crew and I delivered big time. Some of the stops this week were the normal places we usually go with the Safari Explorer, however we added a few extraordinary ones with the focus on photography. 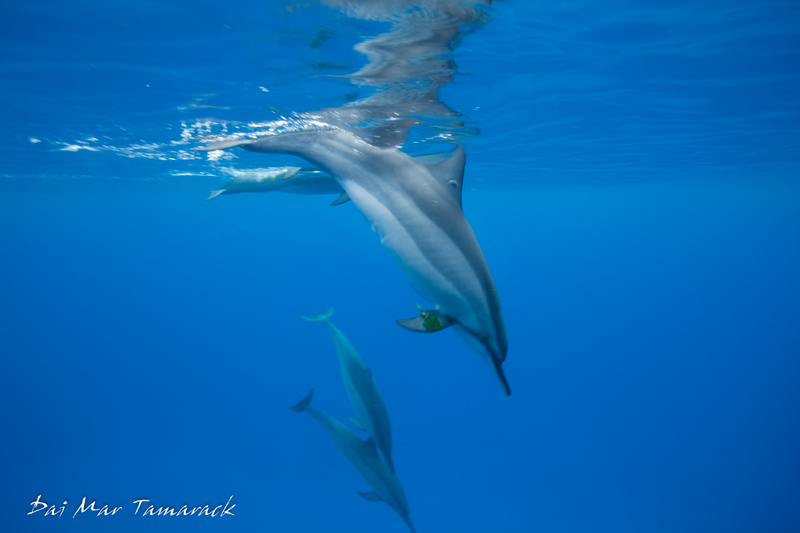 One of these was a morning dedicated to snorkeling with spinner dolphins. This was a bit tricky for me to organize because on some islands this just isn't done (Maui County), and even on the Big Island it is only accepted in one area. Right in Kailua-Kona bay a circus of snorkelers and boats happens every morning, dropping people in with a small pod of resting spinner dolphins. 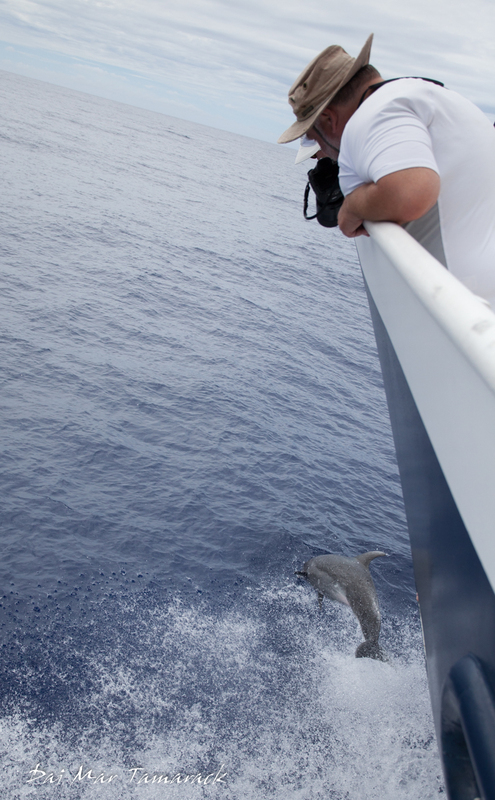 The dolphins don't seem to mind, as they are able to dive down and relax, far away from the snorkelers. However, the day after day aggravation of this circus must play a small role in the behavior of these dolphins. But as far as an almost guaranteed place to snorkel with dolphins this is it. So off we went and had a wonderful morning hanging with wild dolphins. Something we do every week, and this week just happened to be extraordinary, is a blue water hunt for charismatic megafauna in the deep water off the coast of the Big Island. 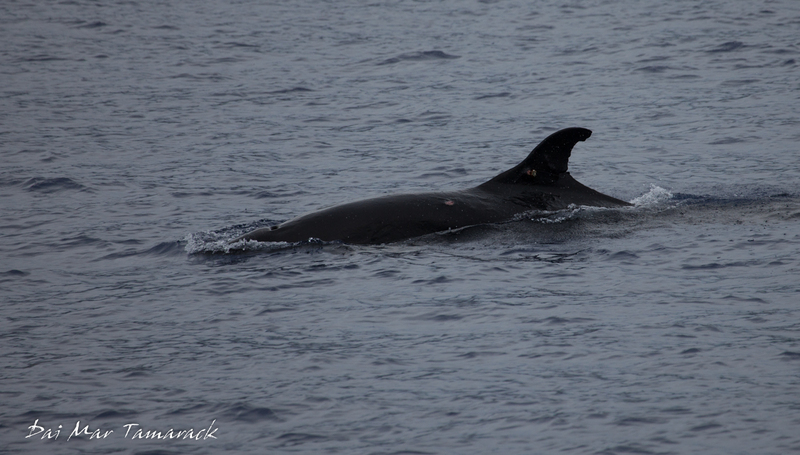 This easy access to deep water gives us the chance to encounter rarely seen deep ocean creatures like pilot whales, rough-tooth dolphins, and beaked whales. On this day we came across a flock of a birds that turned out to be black noddys, a wedgetail shearwater, a brown booby, and three black legged albatross all in the same place. 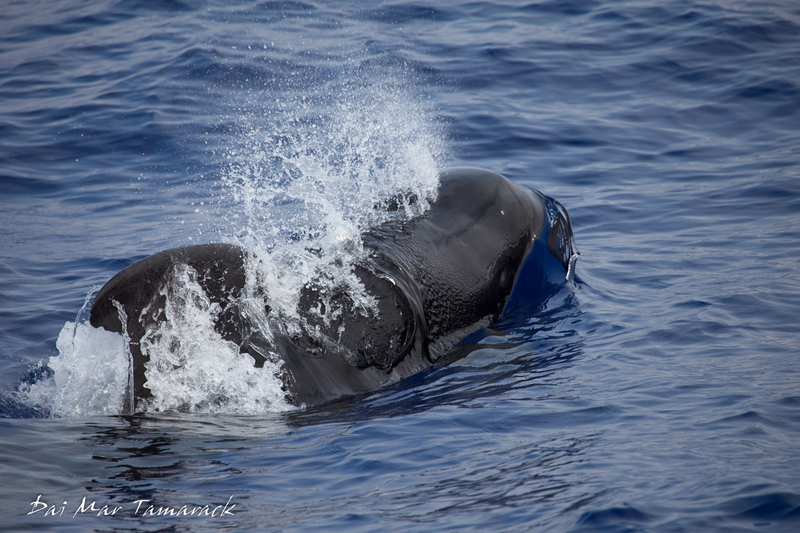 A little while later some splashes and large black fins drew us into a pod of short fin pilot whales. Shooting photography from a moving boat and at a moving subject that only surfaces occasionally provided a nice challenge to all the enthusiastic photographers onboard. 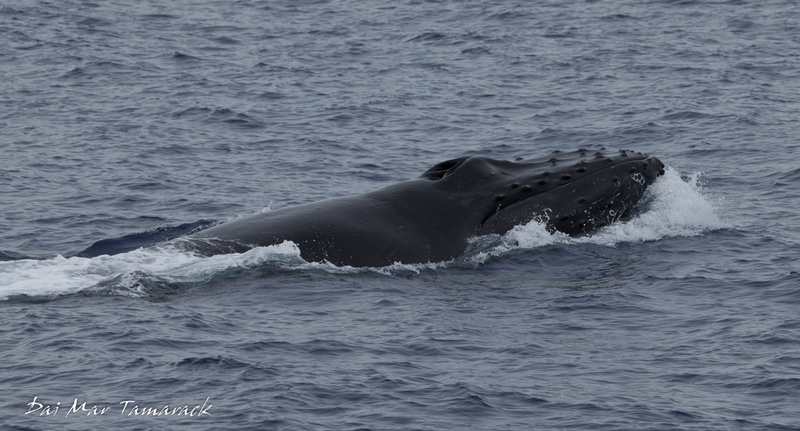 A few days later on Maui we spent an afternoon cruising through the humpback whale national marine sanctuary looking for whale encounters. 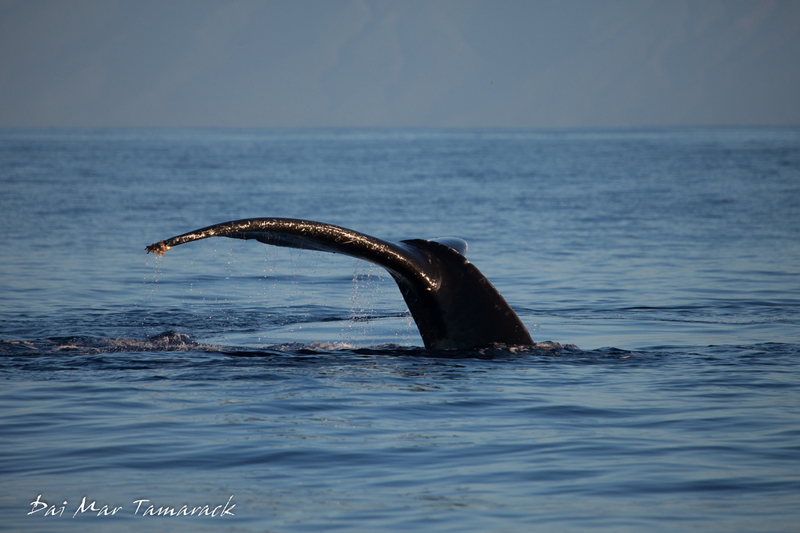 We got lots of great photos of humpbacks competing for mates, and brand new baby whales. 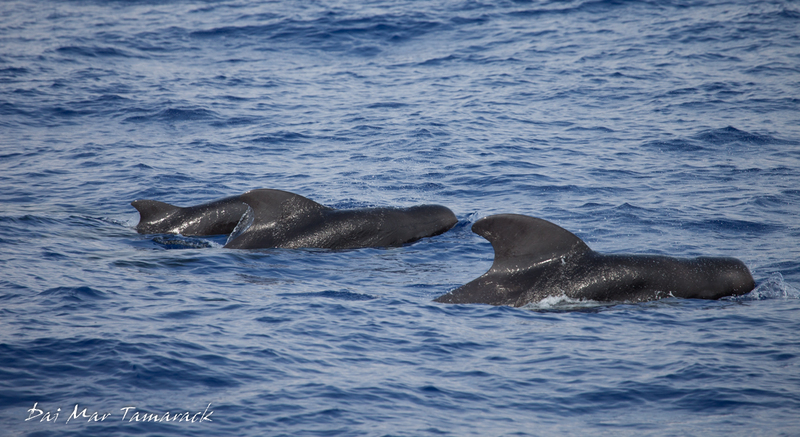 Then Hawaii provided again when a pod of false killer whales swam through the sanctuary. Finally on the backside of Lana'i we got the last encounter I was really counting on for this group, bowriding dolphins. 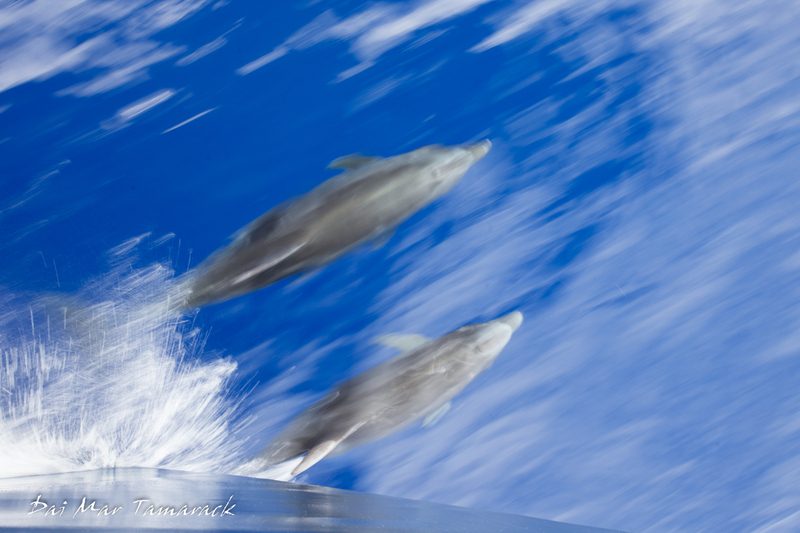 Two playful bottlenose dolphins races in front of our boat for about fifteen minutes, riding the pressure waves the boat creates as it plows through the water. After trying to long exposure to show motion and stepping back to a wide angle to capture a photographer shooting the leaping dolphins I felt pretty good about the encounter. 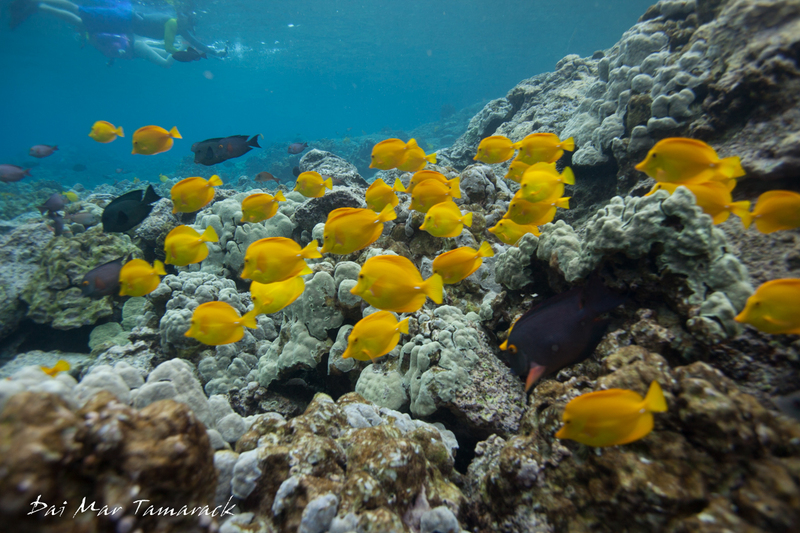 To go along with all of the topside animal encounters we had great snorkeling conditions on all the islands. 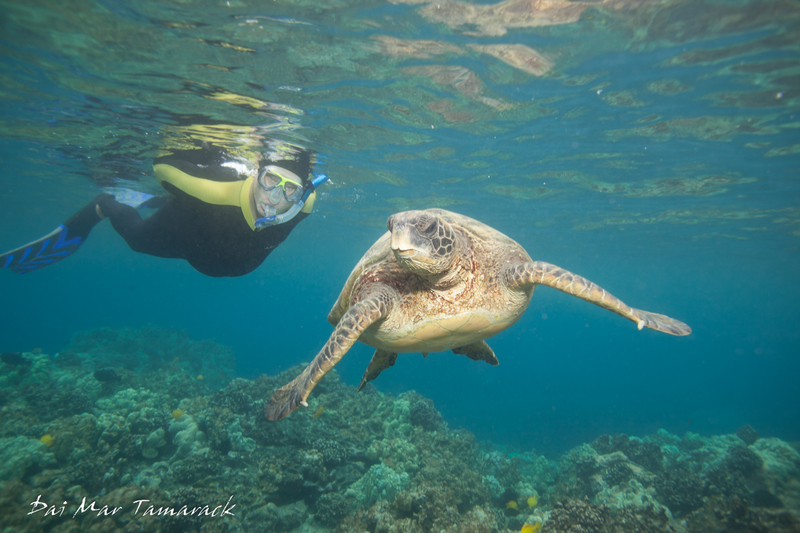 Turtles on every island, sleeping white tip reef sharks, lots of colorful reef fish, manta rays at night, and even a spotted eagle ray. 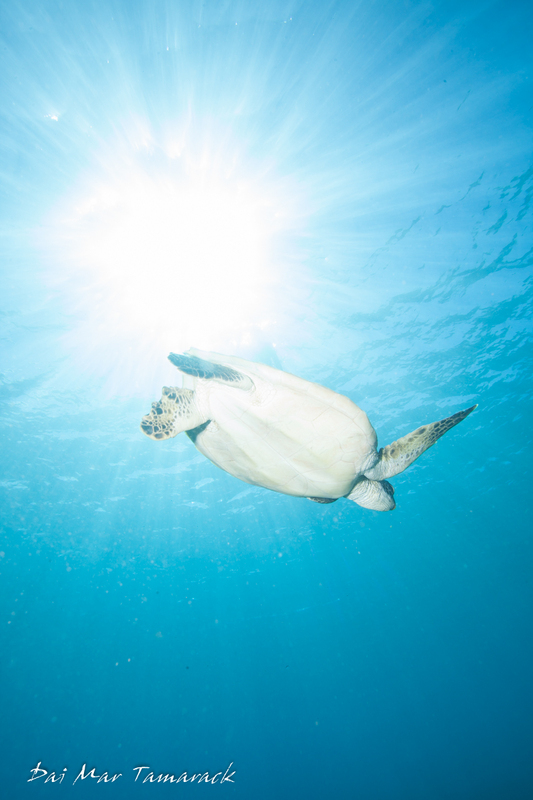 The turtles were definitely the stars since they gave us many close encounters which is what you always hope for when doing underwater photography. 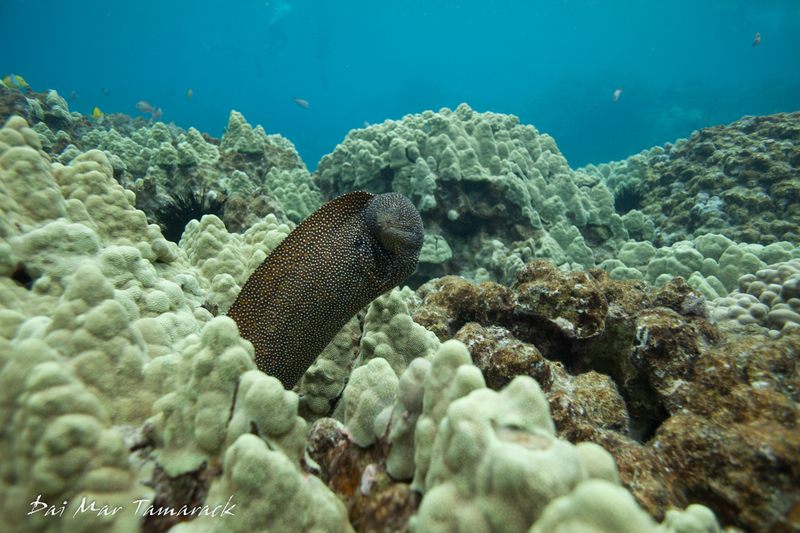 We had a professional underwater photographer onboard as one of the co-leaders of the trip, Michele Westmorland. You can check out her site here. It was fun having another underwater guru onboard to bounce ideas off of. And she really understood and shared in my excitement when I found several Commerson's frogfish on the wreckage of the old Mala Pier. With the small group I felt comfortable taking my big underwater setup with an Ikelite Housing for my Canon 5d mk2. 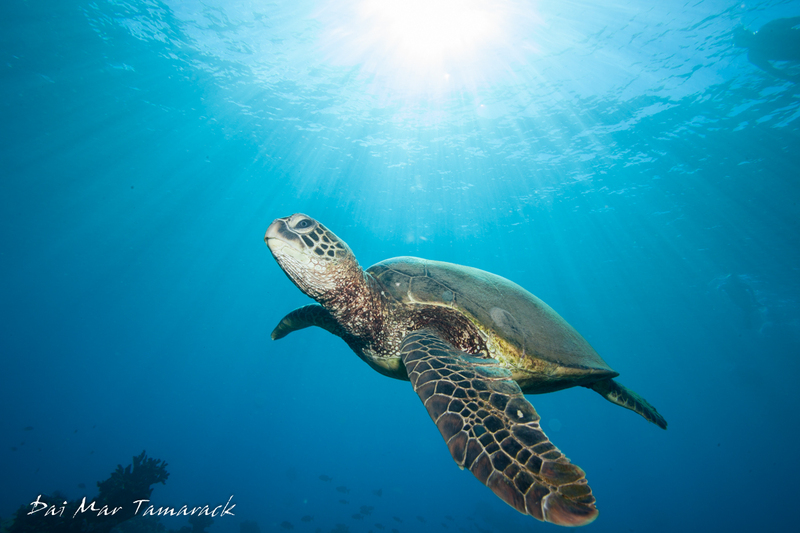 It made getting these shots of turtles with sunburst above them possible. Then there was the landscape photography potential. 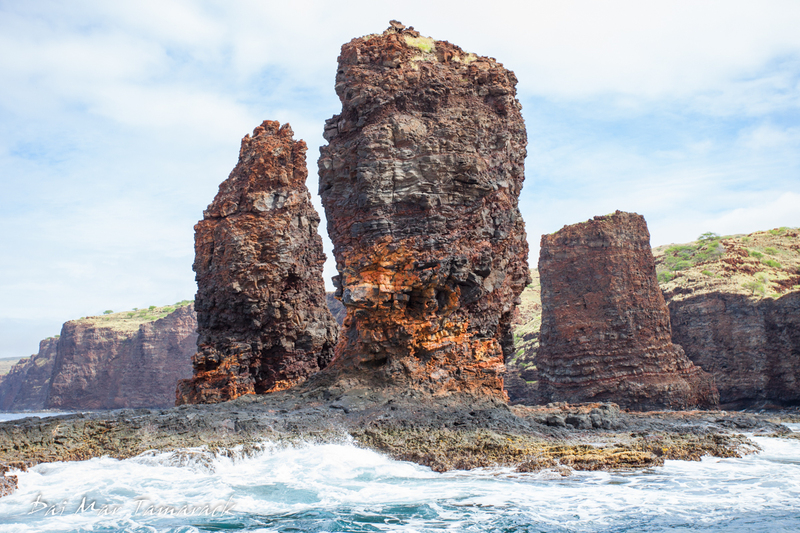 From a photo tour of Lana'i City, to a photo hike to Pu'u Pe'e, to a small boat tour of the erosional sea stacks of Five Sisters, to finally a big boat cruise of the famous cliffs of Molokai, we had it all. These opportunities put all the photographers back on even footing as their skill in the ocean didn't play a part in getting good photos, only their skill as a photographer and the gear they chose to bring. 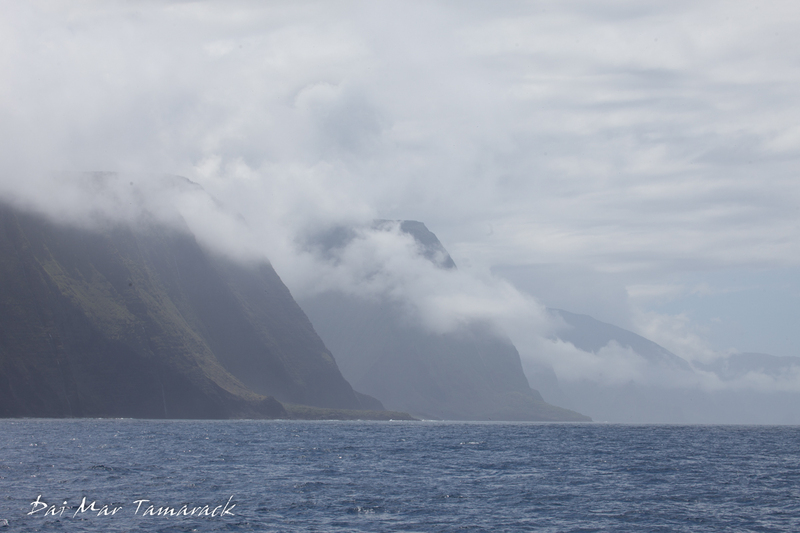 One of my favorite stops was the small boat photo tour at Nanahoa, or Five Sisters. 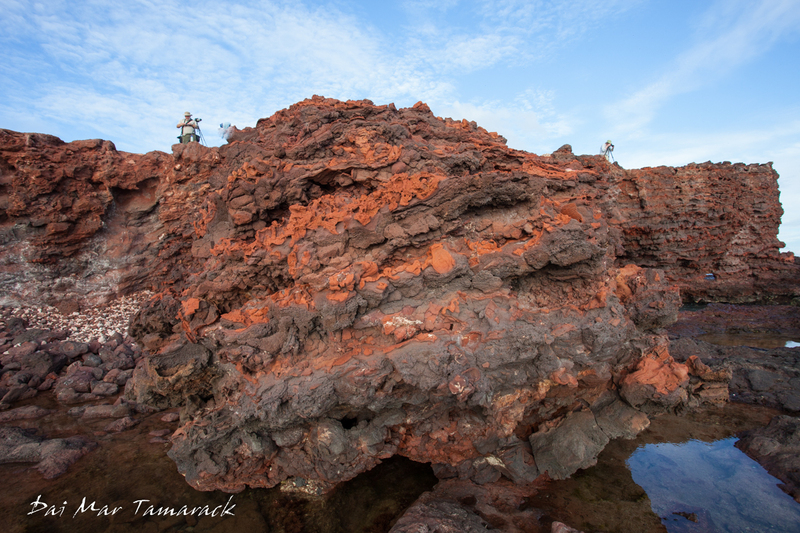 Blowholes erupted and sea stacks mixed dark lava rocks with bright orange streaks of iron ore. Waves crashed against the lower parts and only gave us a glimpse of what was to come farther down the coast of Lana'i at Sweetheart Rock. 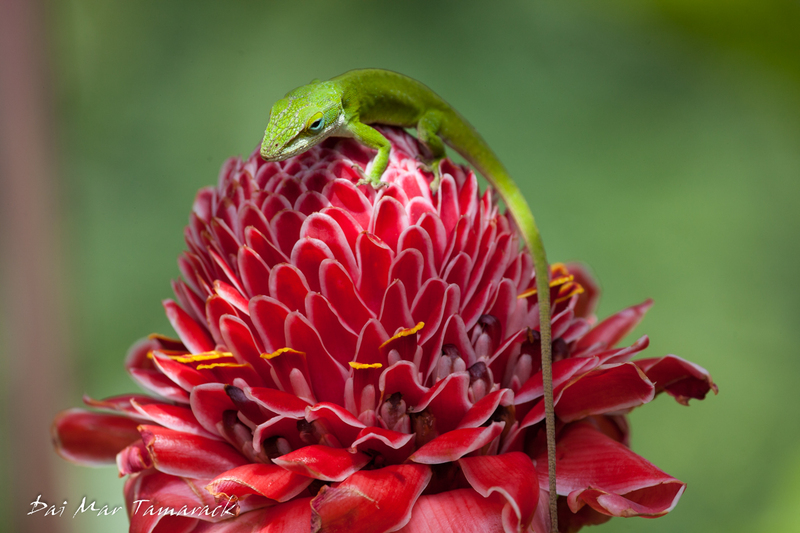 My goal of the week was to show these photographers as many different sides of Hawaii as I could, and to give them opportunities at photos that most tourist don't have. I'm starting to think that maybe I should just start running photo tours among the islands. What fun that would be. I remember spinner dolphins often swimming through the snorkel area at Kealakekua Bay, also known as Captain Cooks on the Big Island. However with all the boat traffic these days its no small wonder that these dolphins give the snorkel zone a wide berth now. However, every once in a while we still get lucky, and today was one of those days. 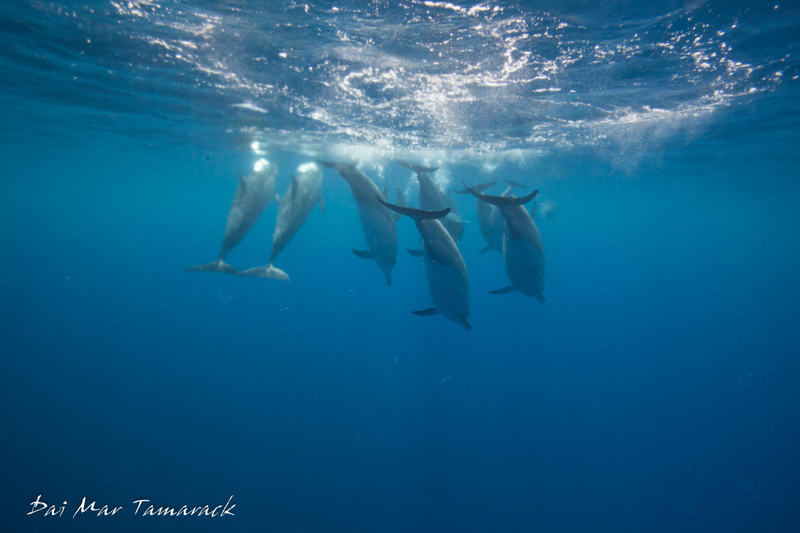 I could hear the high pitched squeeks and squeals underwater before I saw the pod of spinner dolphins. Once they broke the surface with their telltale triangular dorsal fins I was able to plant myself in their probably path. 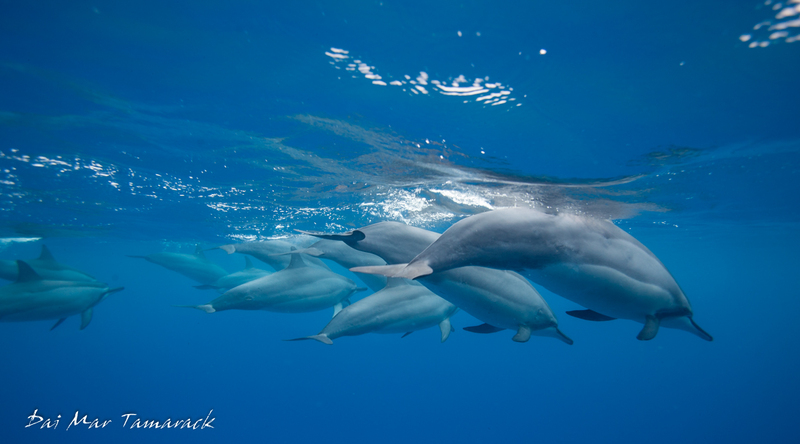 There is always something so magical about a pod of dolphins appearing our of the deep blue. The intelligence is etched in the eyes as they swim by, looking deep into you. They gave me a couple of passes before heading back out to deeper water.